All repair materials are water based. The materials dry naturally or may be dried using a hair drier. 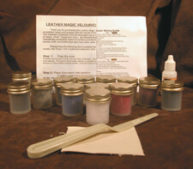 These Repair Compounds are formulated to permanently adhere to the leather. When dry, the repair compound remains soft and flexible to retain the natural look and feel of leather. The compounds are also sandable (once dry) so that making an attractive repair is now easier than ever before. 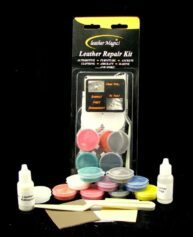 The Leather Magic Leather Jacket Repair Kit uses State-of-the-Art Technology to provide the means to make the types of repairs to leather that we have all been searching for. No other repair kit can compare to the quality and durability that you will achieve with this kit. A Technical support «hot line» is available to answer any questions you may have, or help you with a problem. This Kit has been specially formulated for use on very fine leathers found in Jackets and clothing. Works exceptionally well on very soft Lamb or Goatskin Leather while providing a very permanent and soft feeling repair. Leather, by its very nature, is a natural product and therefore must be treated much differently than other forms of upholstery material such as vinyl. Leather cannot be repaired or treated in the same manner or with the same materials as vinyl. These are two totally different materials and require totally different methods of care. 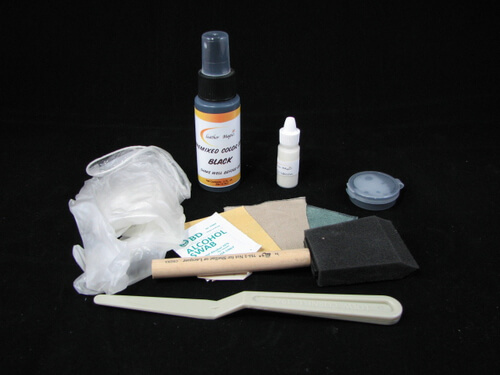 If you have vinyl materials to repair, please check out our Vinyl Repair kits.